The Chokgyur Lingpa Foundation is proud to announce that Kyabgön Phakchok Rinpoche will be performing the Five Extraordinary Treasures Grand Puja in Bangkok from December 31, 2013 to January 1, 2014 in Bangkok, Thailand. The Five Extraordinary Treasures – Long Life, Health, Wealth, Harmony and Dharma – are based on a teaching by Guru Rinpoche in the treasure text The Heart Essence of Oral Instructions (Sheldam Nyingjang), from the New Treasures of Chokgyur Lingpa. These five treasures encapsulate all the qualities that are necessary to render meaning and bring forth true joy and happiness in our lives. Whilst there will be specific activities related to each of the Five Treasures, the puja will center around the accumulation of 100,000 feast offering (Tib. tsok) based on the practice of Sampa Lhundrup. As one might well imagine the costs related to transporting Rinpoche, six monks and five nuns from Nepal and housing them for the duration of the event are not some small insignificant amount. In addition, there are costs related to the setting of the Mandala and conducting the Puja. We humbly seek your support. 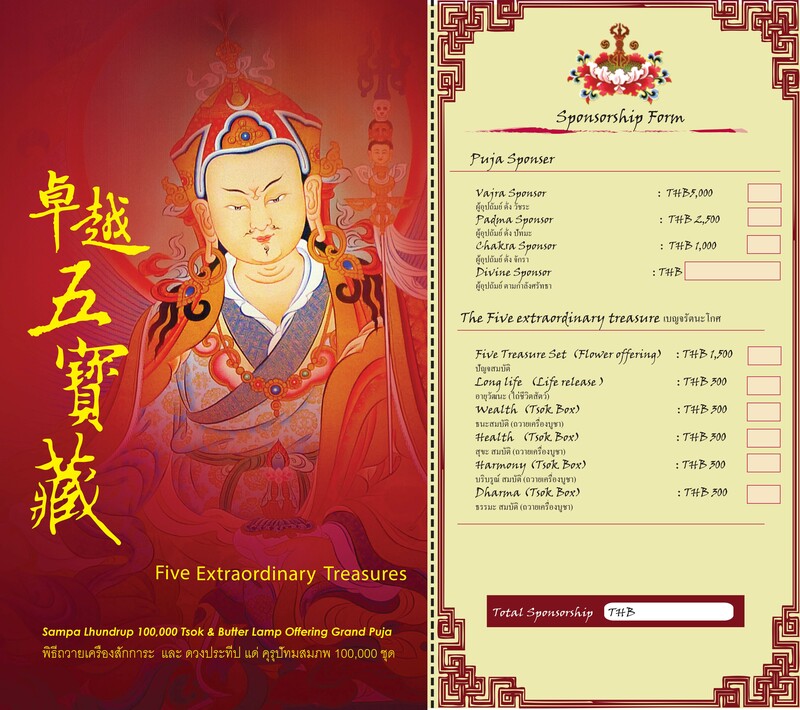 His Holiness Phakchok Rinpoche has kindly offered to all attendees a gift directly related to Guru Rinpoche blessings.